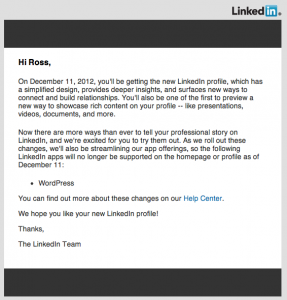 LinkedIn is making some much-needed changes to its timelines and profiles. New features include more ways to connect and build relationships and the ability to showcase presentations, video and documents. It also means that some of the features that you might be using in your old profile or timeline might disappear. One of these features is the ability to showcase content from your WordPress blog in your profile. The old profile allowed you to add a widget which displayed all your blog posts. This worked just fine, although it was ultimately made redundant by features in the timeline. I stopped using the profile widget ages ago and now exclusively post my blog updates using Jetpack to the LinkedIn Timeline. The benefit of this approach is that everyone who is in my network will receive my update, where the older approach only showed my blog posts to people who visited my profile. Although this a small step for LinkedIn and I think it’s a step in the right direction and I’m really looking forward to checking out the new timeline and profile features. I’ll post an update with my thoughts when I get a chance to check them out. I’ve been using Jekyll for my site, though life is getting much harder without WordPress. This is just another reason to switch back.